Spend some time with Mom working on this fun Mother’s Day Word Search puzzle. And don’t forget to serve her breakfast in bed, too! 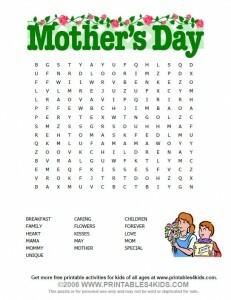 Click image to view and print the Mother’s Day Wordsearch full size or download Mother’s Day Word Search as a PDF file. This is my first visit to this website, and I’m SO happy I found it!! As a substitute teacher, I am always looking for fun things to occupy the students, and I know they’ll enjoy the activities on this website!! This is a wonderful web site that offers a lot of free ideas. i think the word search is awsome!!!!!! !